Because of the rapidly shrinking dimensions in VLSI, transient and permanent faults arise and will continue to occur in the near future in increasing numbers. Since cryptographic chips are a consumer product produced in large quantities, cheap solutions for concurrent checking are needed. Concurrent Error Detection (CED) for cryptographic chips also has a great potential for detecting (deliberate) fault injection attacks where faults are injected into a cryptographic chip to break the key. 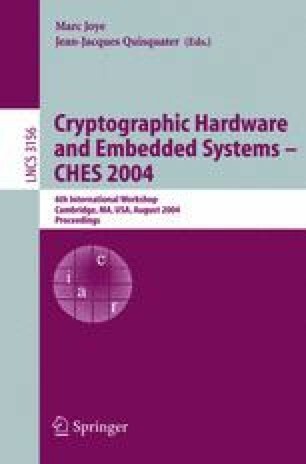 In this paper we propose a low cost, low latency, time redundancy based CED technique for a class of symmetric block ciphers whose round functions are involutions. This CED technique can detect both permanent and transient faults with almost no time overhead. A function F is an involution if F(F(x))=x. The proposed CED architecture (i) exploits the involution property of the ciphers and checks if x=F(F(x)) for each of the involutional round functions to detect transient and permanent faults and (ii) uses the idle cycles in the design to achieve close to a 0% time overhead. Our preliminary ASIC synthesis experiment with the involutional cipher KHAZAD resulted in an area overhead of 23.8% and a throughput degradation of 8%. A fault injection based simulation shows that the proposed architecture detects all single-bit faults.